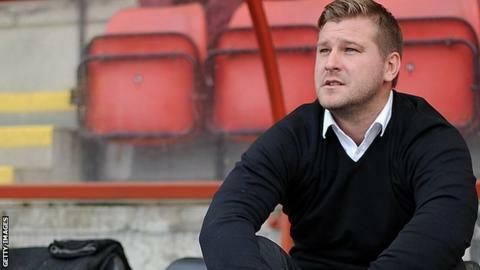 Karl Robinson's agent has rejected speculation linking the MK Dons boss with the managerial vacancy at League One rivals Sheffield United. Reports on Wednesday suggested Robinson was in line to take over at Bramall Lane after David Weir's exit last week. The Blades are believed to be keen on making a quick appointment. "There have been no talks with Sheffield United and I am not exactly sure where the story has come from," Rob Segal told BBC Radio Sheffield. "Karl has a project he is working on within a financial structure at MK Dons and at this moment in time is only focusing on that." Robinson, 33, was linked with the Sheffield United post at the end of last season but chose to remain with the Dons. United, who host Port Vale on Saturday, are bottom of League One with five points from 11 matches.